Aleksandar Mlazev released Alien Box, another totally unique effect for AUv3. The idea behind this one is to make your sounds more impactful and BIG; with increased sustains and an LFO gently modulating a resonator. He notes that this is ultimately a modulation effect, but it is unlike a flanger/phaser. There is unfortunately no demo for this one yet. 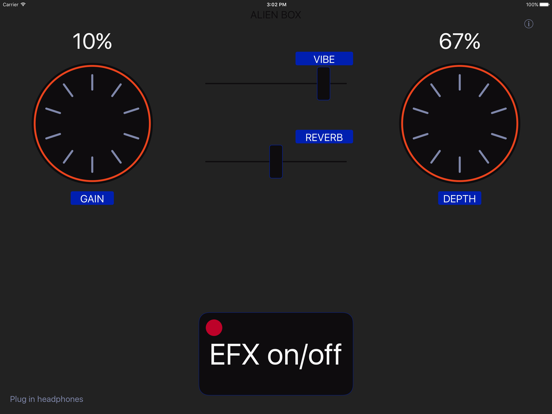 The app is an Audio Unit Effect AUV3 and can be used inside GarageBand or other AU host apps as an effect plug-in. Alien Box can also run as a stand alone app adding effect to the audio input so you can play your guitar, bass or synth directly three the app if you have the connector to do so. uh.. okay Aleksandar, next FX release, provide a simple demo BEFORE releasing the app. You’d do yourself a favor by boosting your sales opening day, but you’ll also have the satisfaction knowing that customers were purchasing a product based its binaural qualities rather than the deaf-faith of a description. Help-us-help-you!